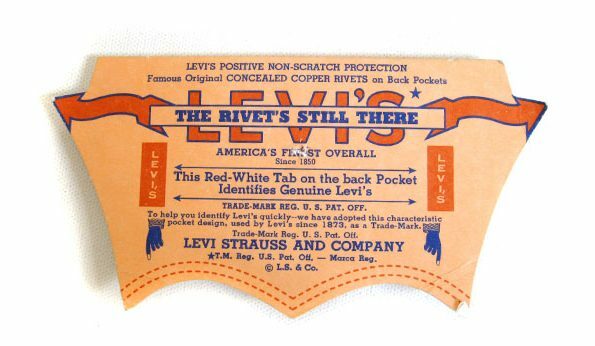 It was the year 1936 that Levi’s Jeans introduced their famous Red Tab onto the right back pocket of their jeans. 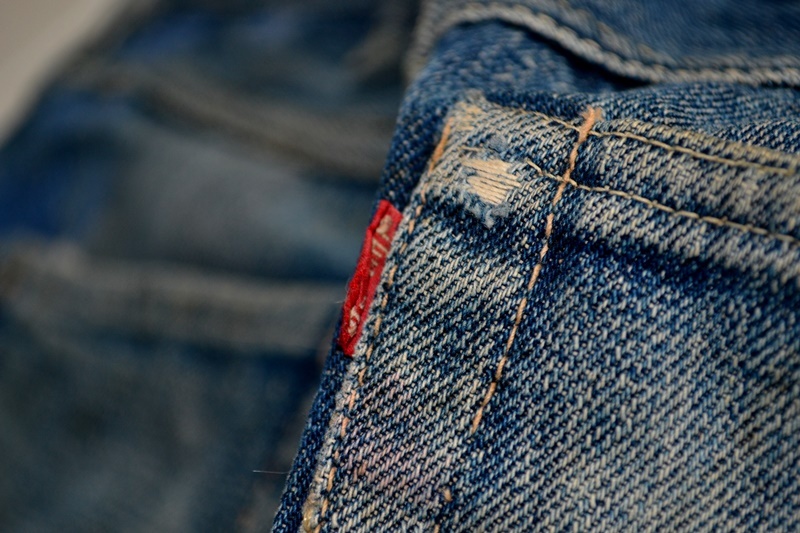 The Red Tab was created to differentiate Levi’s Jeans from their competitors. 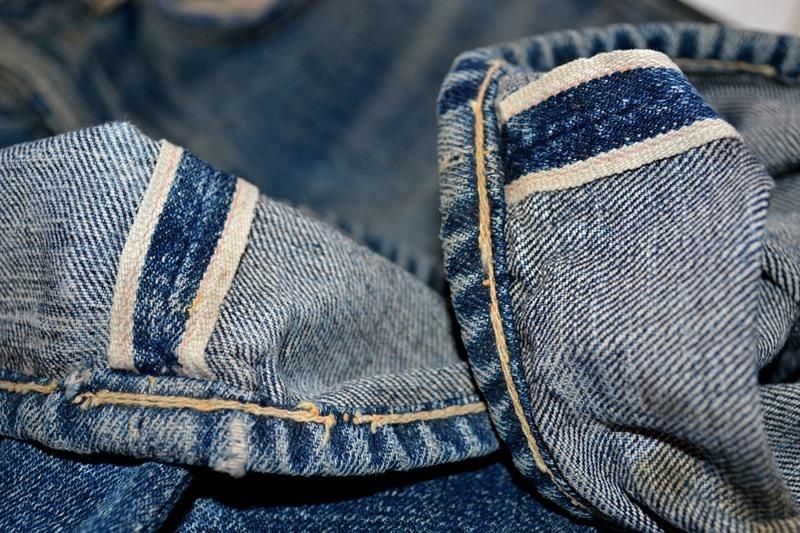 This was because a lot of their competitors were also using dark denim and also arcuates on the back pockets. 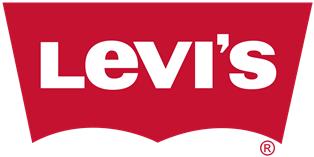 Levi’s registered their arcuate stitching later in 1943. 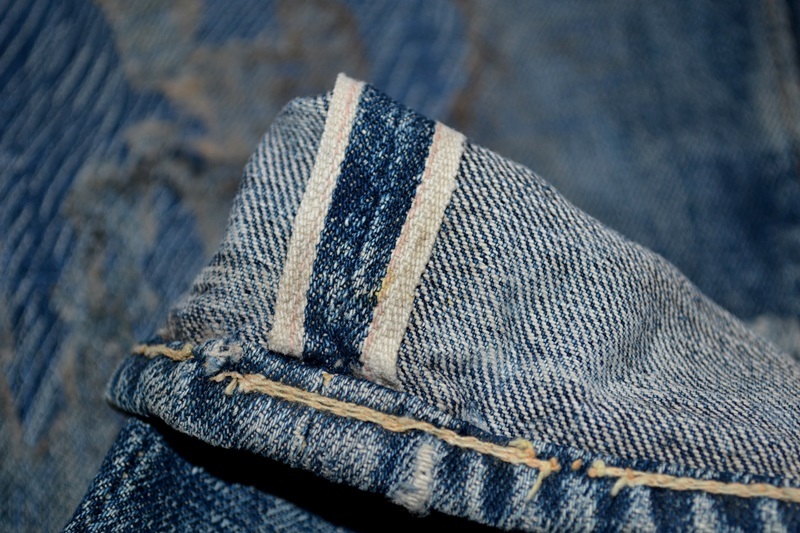 The arcuates of this pair of 501XX are singled needed. 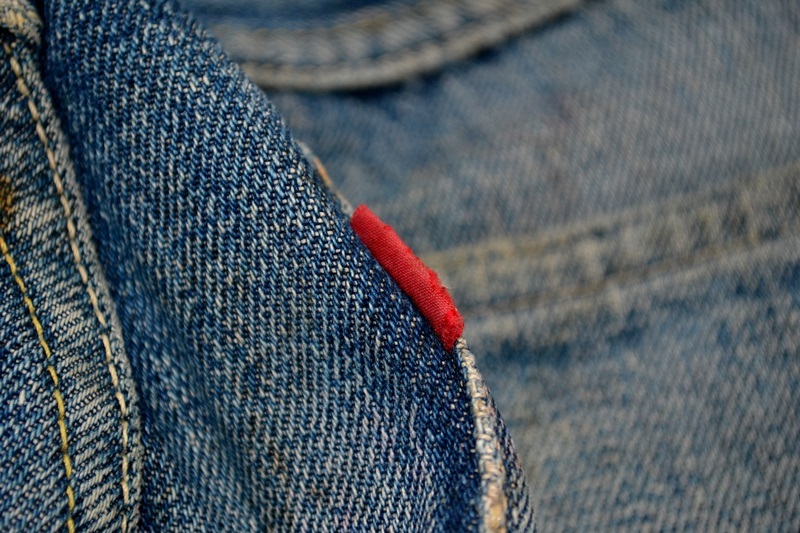 The colour red for the Red Tab was chosen because it contrasted well with the dark denim and was easy to see. 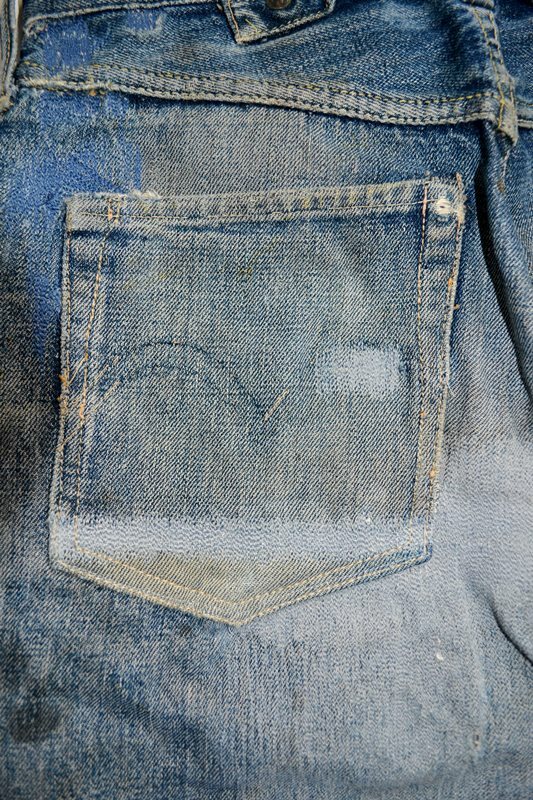 The word LEVI’S is stitched in white in all capital letters (also known as Big E amongst denim collectors) on one side only of the tab. 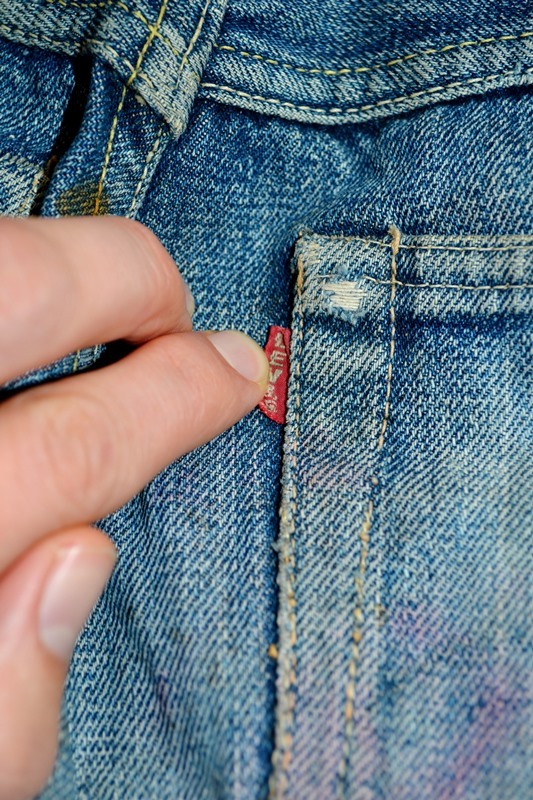 In 1971 Levi’s Jeans switched the letters on the tab, the Red Tab ‘Big E’ items were produced until that year. 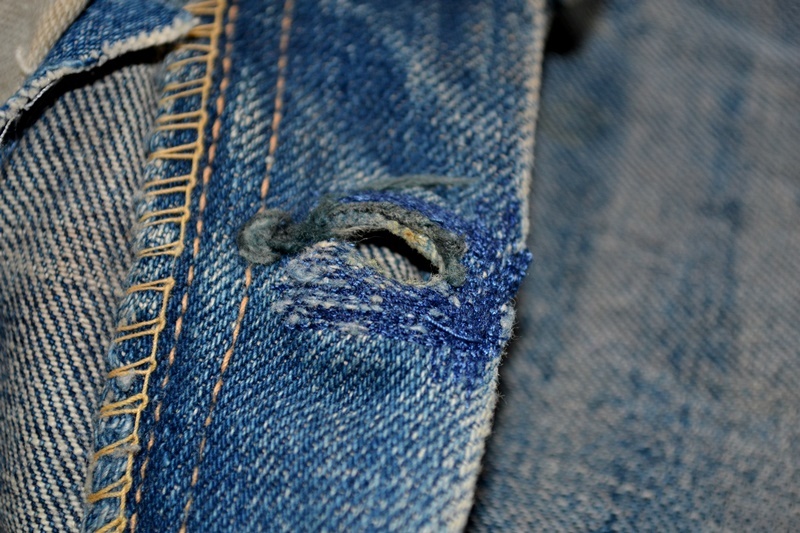 Another key feature on this jeans are the so called hidden rivets. 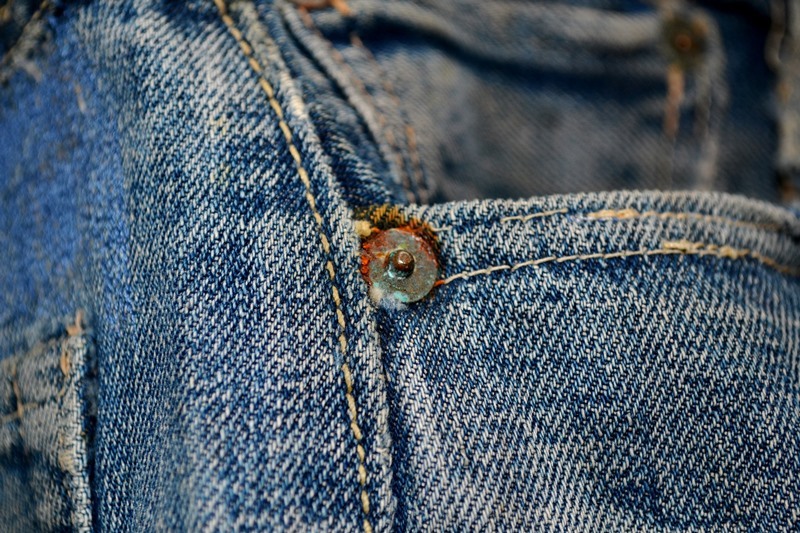 In 1937 Levi’s Jeans introduced these hidden rivets on the back of the pockets. 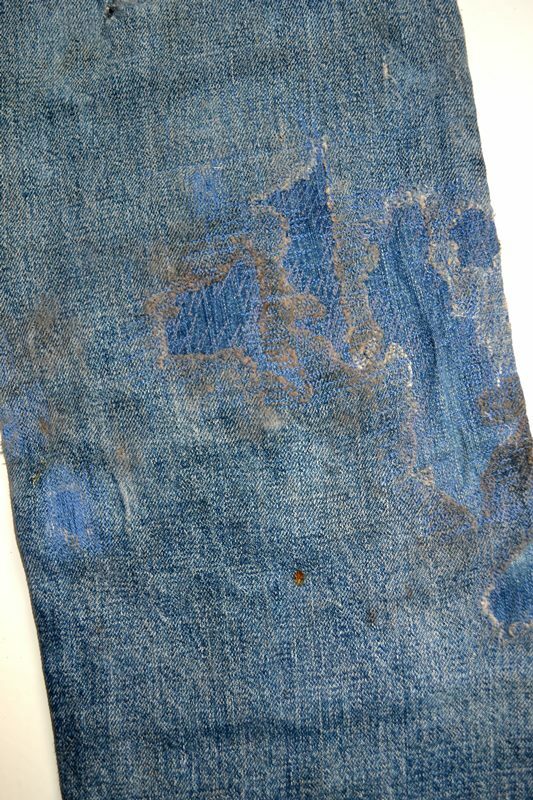 The rivets were sewn so that they were only visible from the inside, due to consumer complaints regarding scratching furniture and saddles. 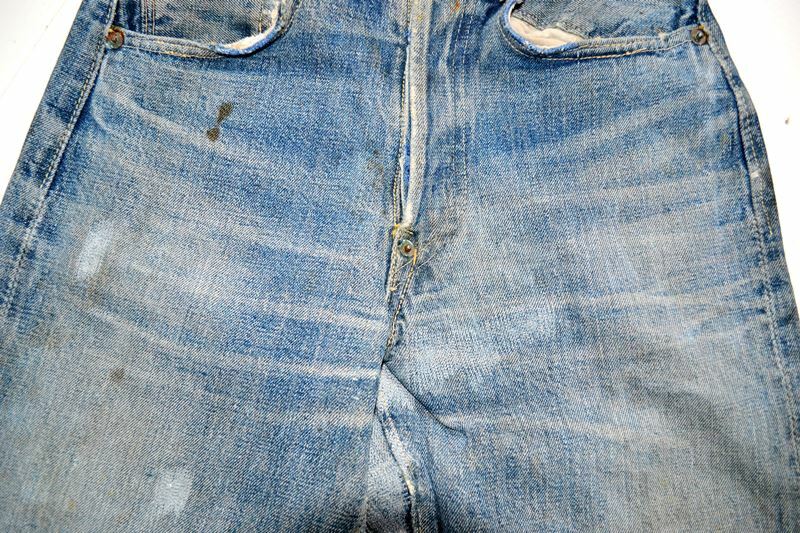 This featured jeans style was popular by Cowboys, so they complaint about their scratched leather saddles. 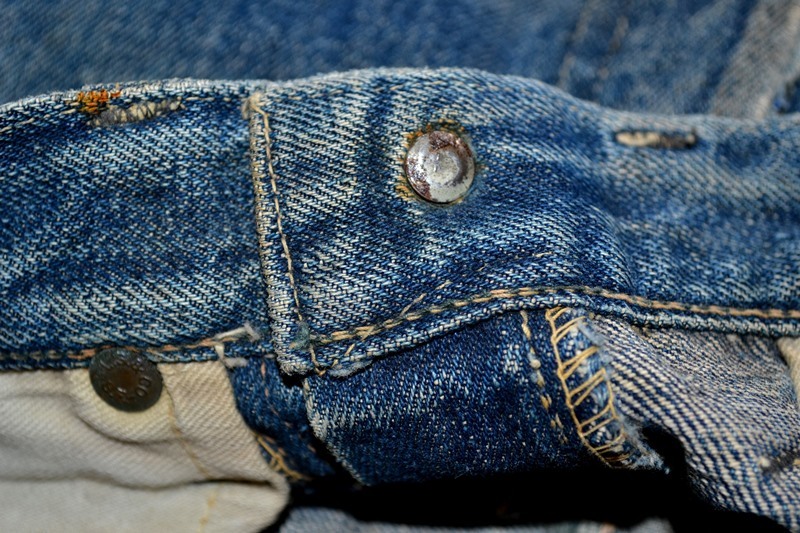 The suspender buttons were removed on the previous model, the 501XX 1922 model. 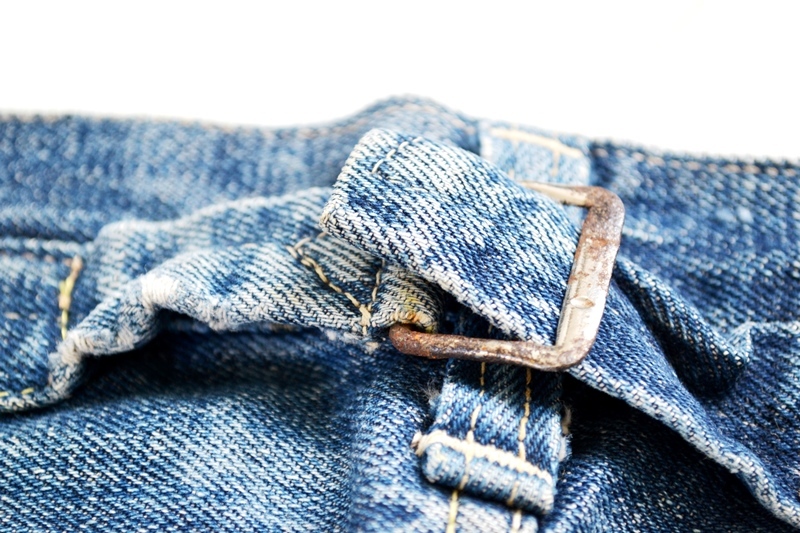 But customers could add the suspender buttons, which were called snap-on buttons, at their local workwear store. 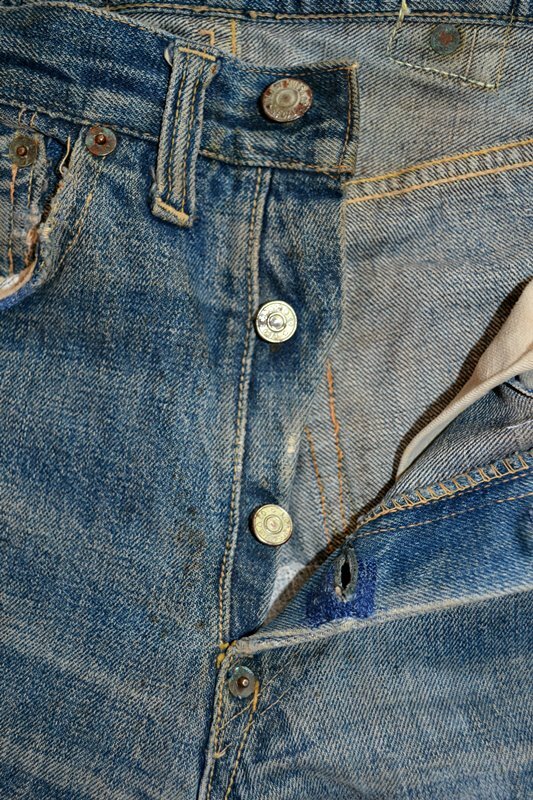 On each pair of Levi’s Jeans 501XX from 1937 was a pocketflasher with the words: ‘The Rivet’s Still There’ as introduction of the hidden rivets. 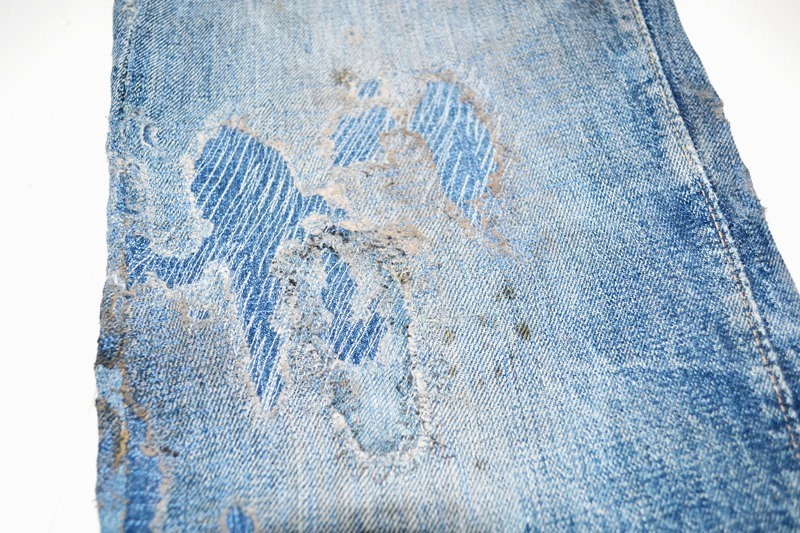 Pic by My Denim Life. 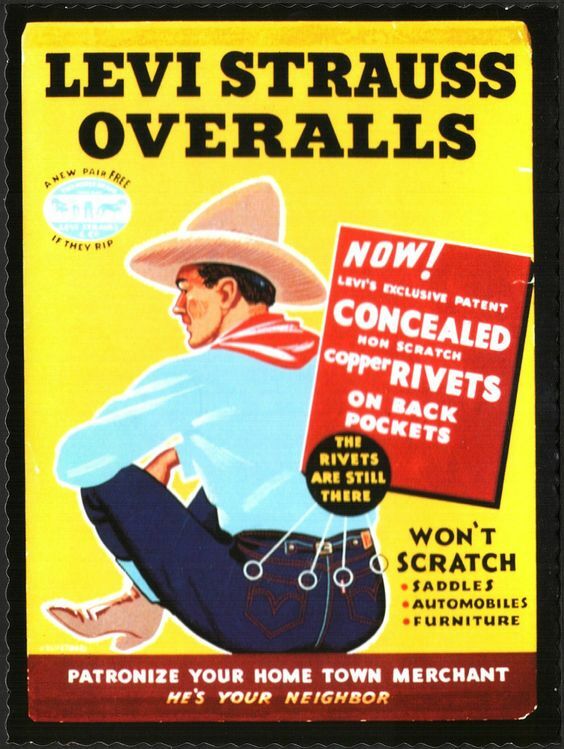 Original vintage Levi’s Jeans 501XX – Cowboys ‘Hidden Rivets’ advertising. 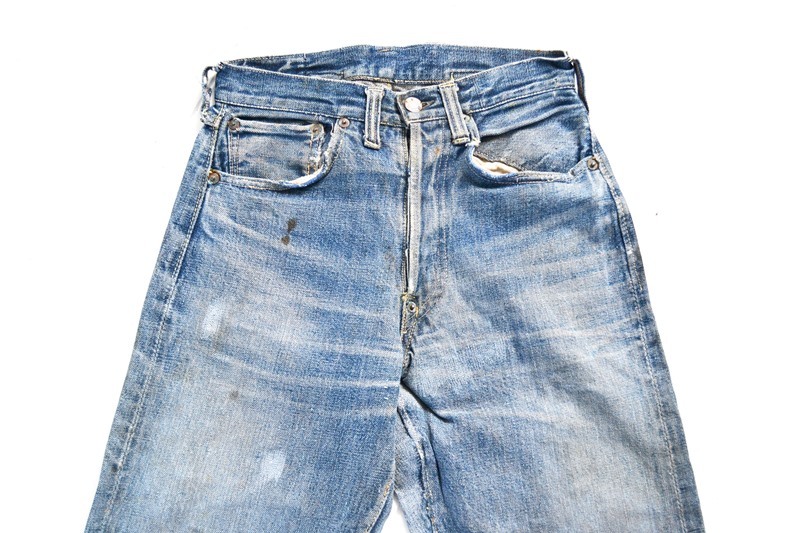 The crotch rivet was one of the iconic reinforcements, but was eliminated when the President of Levi Strauss of that period, Walter A. Haas jr, went on a camping trip in his 501’s. 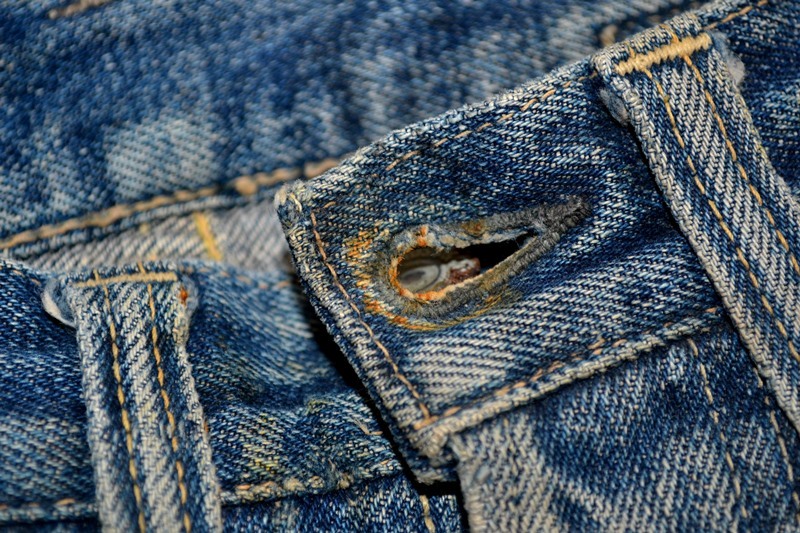 He found out that the crotch rivet became very hot when sitting around a campfire. 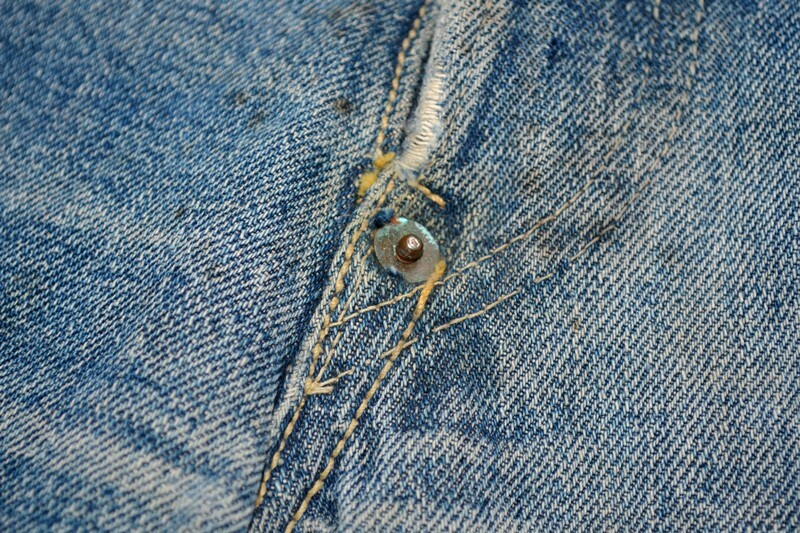 As you can imagine that this was very uncomfortable for his crotch, he decided to eliminate this rivet. Cowboys were very happy with this decision. 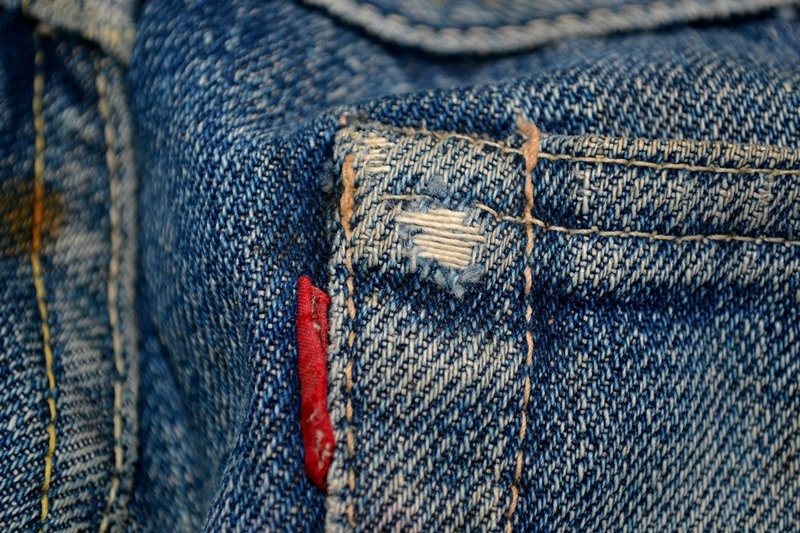 Levi’s Jeans crotch rivet commercial. 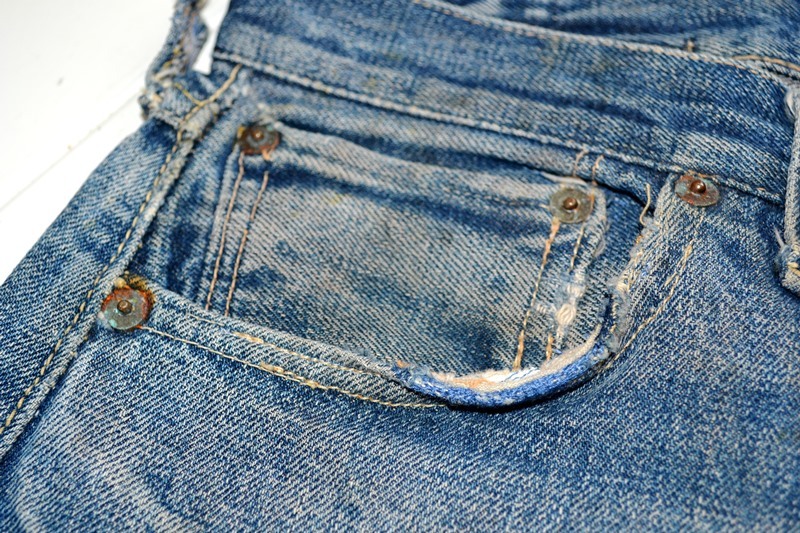 The cinch back is another key feature on a pair of vintage waist overalls. 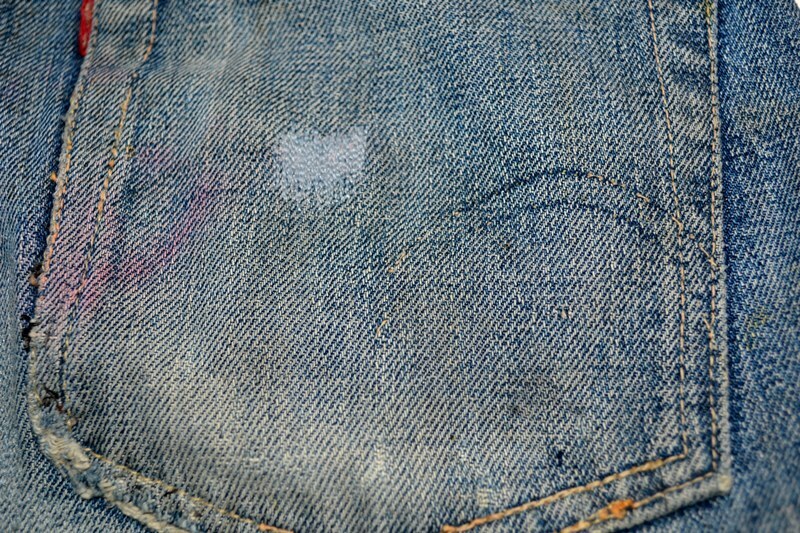 This part of an overall was there from the beginning of every pair of miner pants. 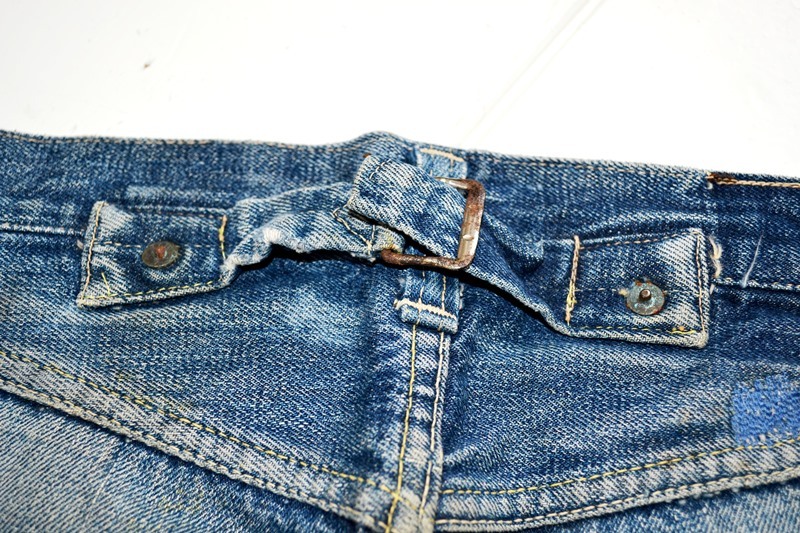 The cinch back on Levi’s Jeans was part of every jeans until World War 2. 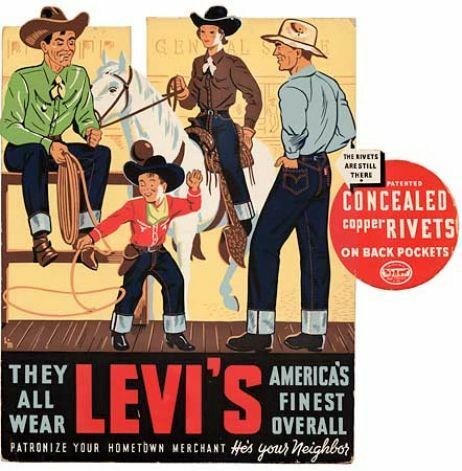 Changes during WW2 are made by Levi’s products, but in fact this was a standard for everyone, in order to conform to rules set by the War Production Board for the conservation of raw materials. 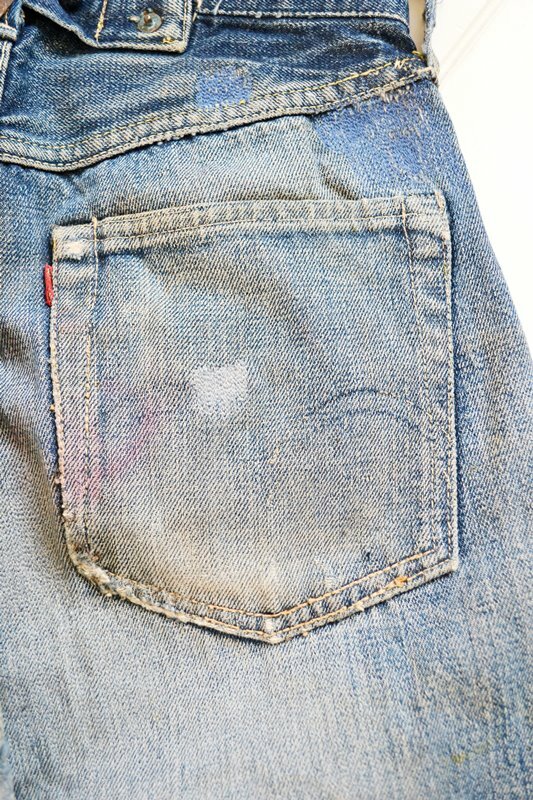 The famous Levi’s arcuates on the back pockets were painted instead of stitched to save thread. 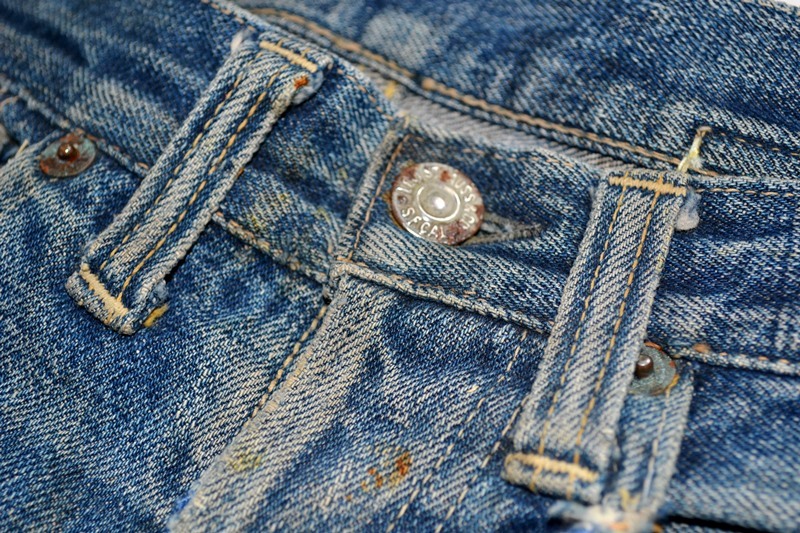 The back waistband cinch is completely removed and, to conserve metal, so are the watch pocket rivets. 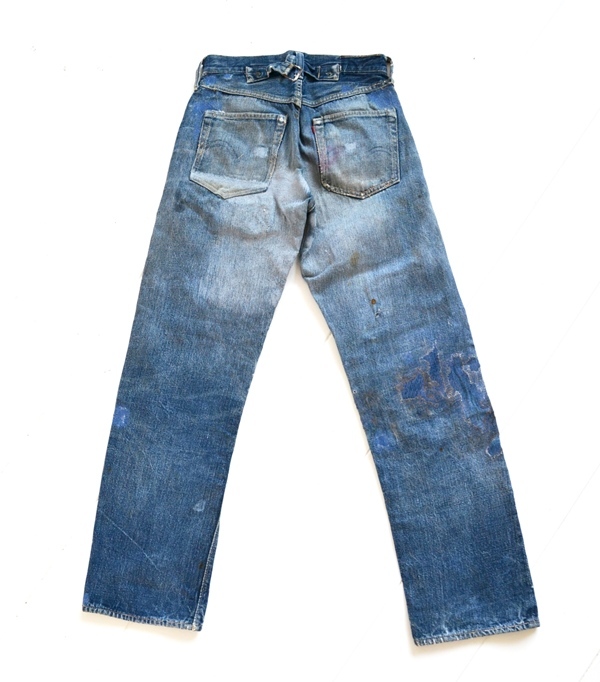 The Levi’s Jeans 501XX from 1937 is made of Cone Mills 10oz redline righthand selvedge denim fabric. 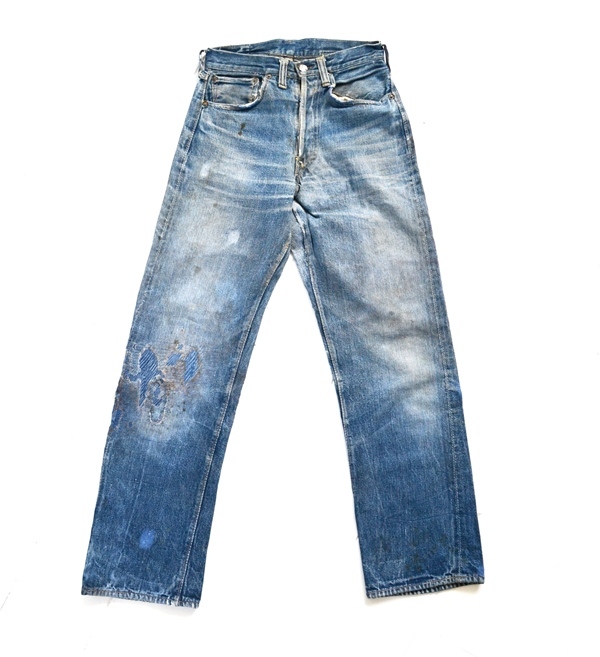 Unfortunately the White Oak plant from Cone Denim will close their doors by the end of this year. Read more about this here. 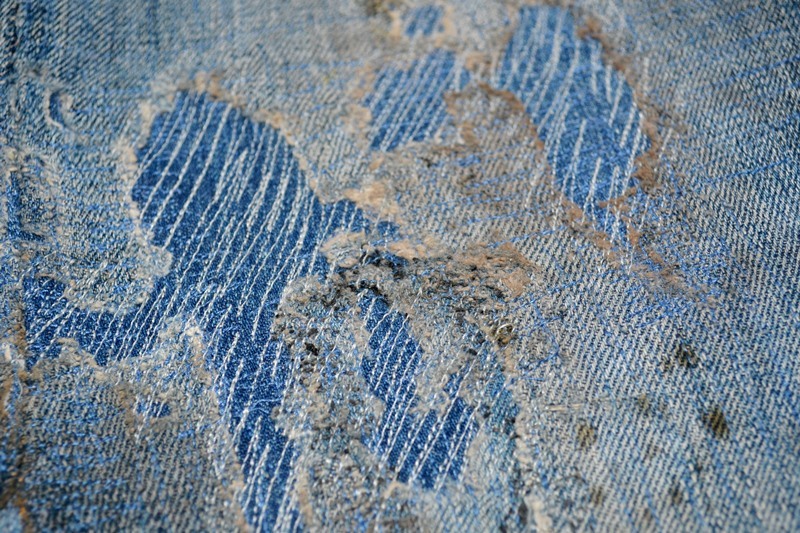 This pair of Levi’s 501XX jeans from 1937 has an all-over worn-out look with a lot of different blue shades. 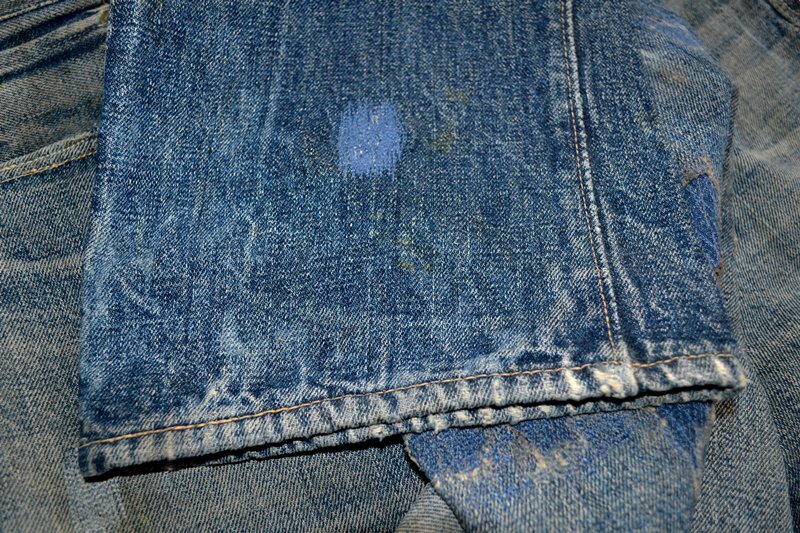 Levi’s Jeans from this period shows beautiful and more heavy fades than others because of the fact that these jeans were worn on the than popular Cowboy ranch life. 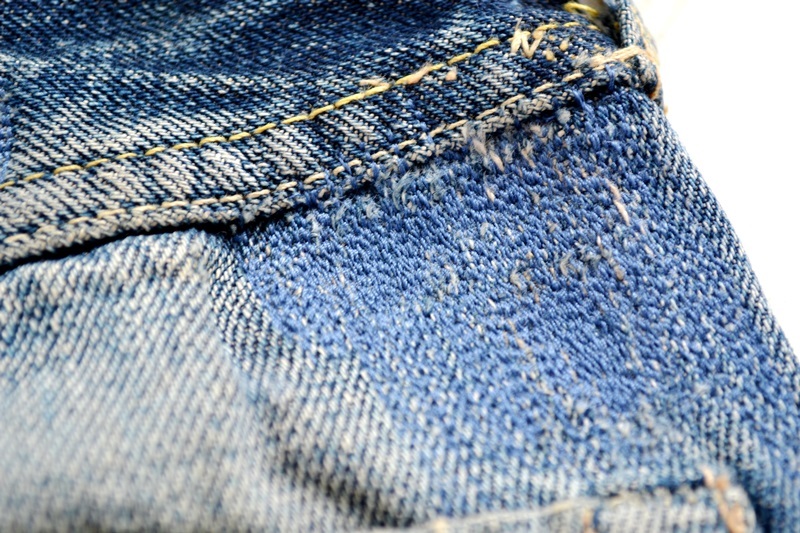 This jeans is repaired many times with patches, and other colour thread. 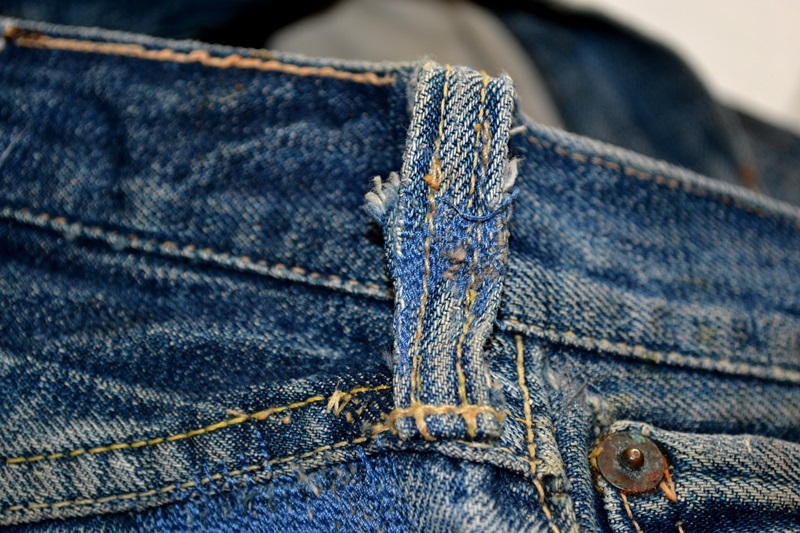 Most of the repairs are done on both legs, button holes and belt loops. 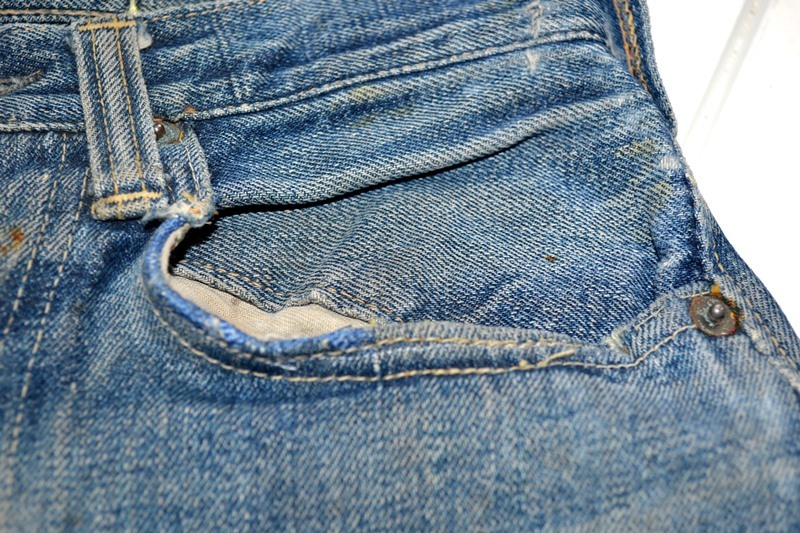 The size of the jeans is like a sixteen years size, so the jeans was worn by a teenager kid or a women as it was very difficult to find jeans for women during the ’30’s. 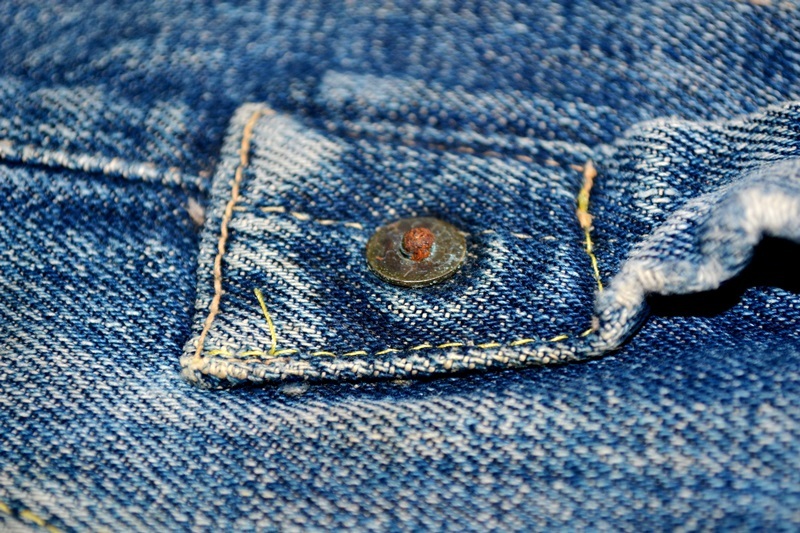 The smaller size also explains why there’re only two buttons at the closure. 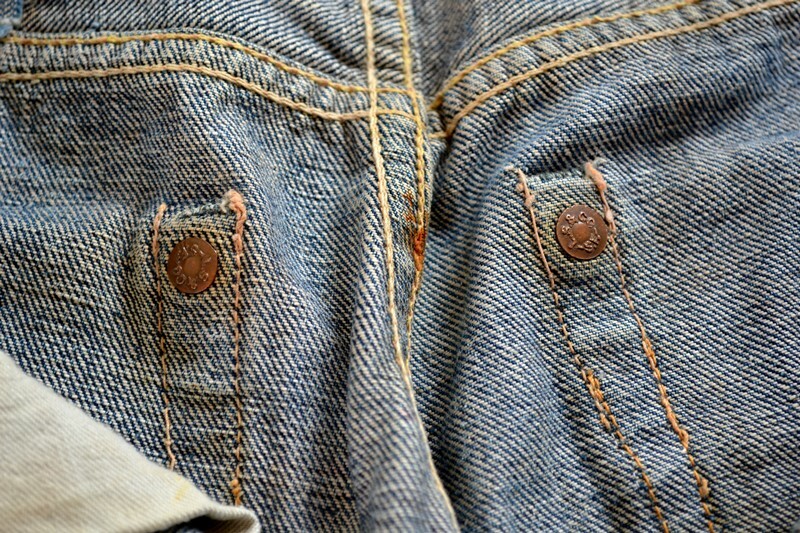 On the back of the top button you will see the precursor of the legendary V-stitch. 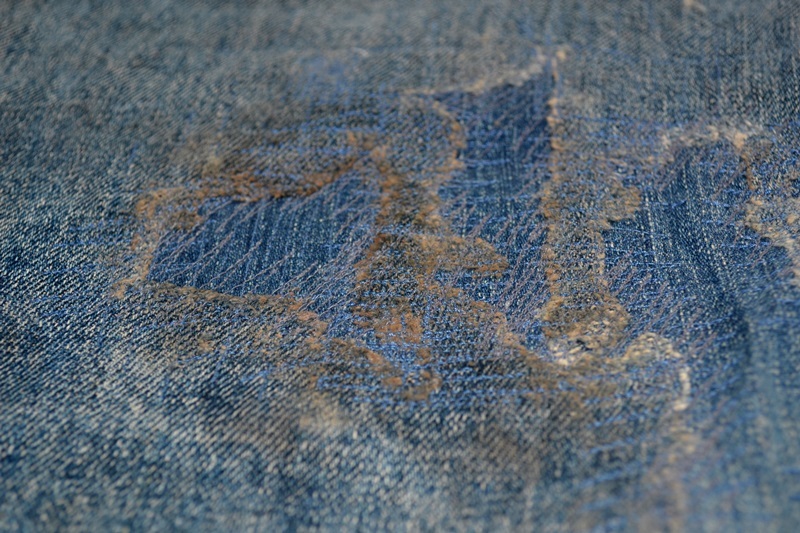 From 1937 and on this became a standard, but the first runs shows a less clear V-stitch. 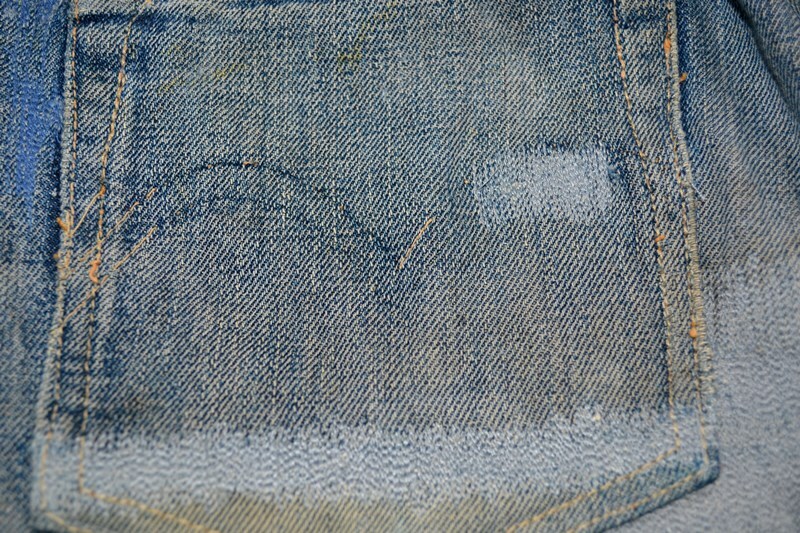 During this time you will see various different arcuate curves on the back pockets, this reflects each operator skills. These curvy arcuates are also known as Crazy Eagle. 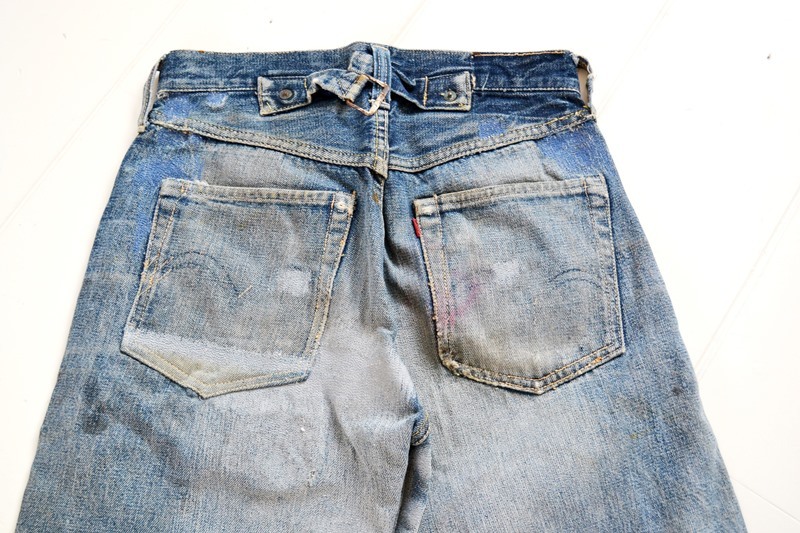 These Levi’s Jeans 501XX jeans are also known as super vintage amongst collectors. 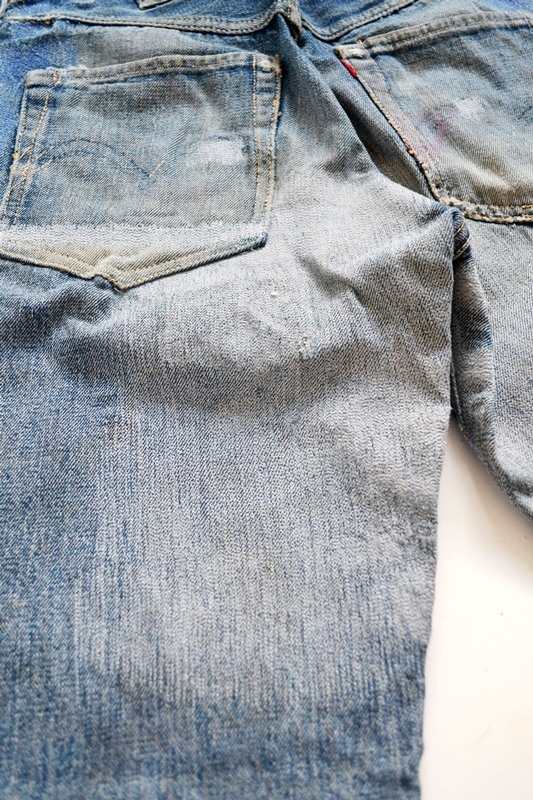 Proud to have such an historical piece in my private denim collection. Viva America. 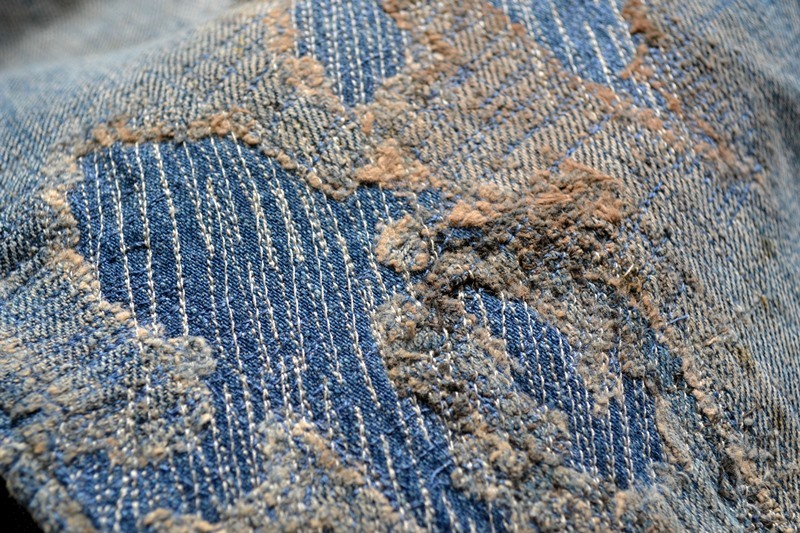 Original vintage Levi’s 501XX Jeans from 1937.